50 tons takeoff weight, and 900 feet (300 meters) takeoff and landing distance on the water at loaded weight. ShinMaywa US-2 giant seaplane’s amazing takeoff is almost incredible, but you can see on my video compilation several times. The ShinMaywa US-2 amphibian has a unique boundary layer control system, which uses compressed air from the slit of the flaps to prevent air flow separation and increase lift. This ground effect flight and the special design of his boat body allows the amphibian to land in high sea waves that would inaccessible for other seaplanes. 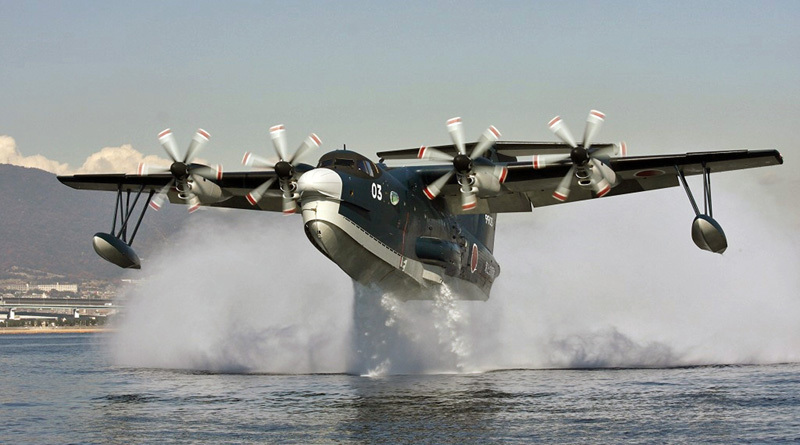 ShinMaywa US-2, manufactured by Japan-based ShinMaywa Industries, is a modern amphibious aircraft is a veritable force multiplier since it fulfils a multitude of missions in a single platform. It is an unique aircraft and the only ‘in service’ open sea capable amphibian aircraft with state of art equipment, very rough sea operations (Sea state 5 up to 3m wave height), riverine/lake landing capability, STOL features, long endurance and extended radius of operations with large payload capacity. With such unique features, US-2 may be considered as an effective platform to carry out ‘Benign’ missions such as SAR, CASEVAC, Humanitarian Relief and Disaster Management, and ‘Constabulary’ missions such as extended EEZ surveillance,Maritime Domain Awareness (MDA) missions of the Indian Navy etc. The ShinMaywa US-2 fleet is deployed by Japanese Maritime Self Defence Forces across their remote islands chain for Exclusive Economic Zones protection, surveillance and Search & rescue operations. India and Japan are now discussing the methodology of procurement of Amphibian Aircraft US-2 requirements of the Indian Navy. Both nations are working on the way forward to induct this aircraft in India. Both ShinMaywa and Mahindra Defence have entered into this partnership with a view to set up MRO services in India and also undertake manufacturing, assembling of structural parts & components for US-2 amphibian aircraft etc. Mahindra is the only Indian private sector OEM for small aircraft which sold in many countries globally. Given their joint capabilities it is only natural that both companies have come together and are confident of delivering solutions for this aircraft as mandated by the Indian Ministry of Defence.